Support for FRONTLINE is provided by viewers like you, Corporation for Public Broadcasting, John D. and Catherine T. MacArthur Foundation, Ford Foundation, Abrams Foundation, Park Foundation, The John and Helen Glessner Family Trust, Heising-Simons Foundation, Wyncote Foundation, and the FRONTLINE Journalism Fund with major support from Jon and Jo Ann Hagler on behalf of the Jon L. Hagler Foundation. Additional support for the FRONTLINE Journalism Fund is provided by: Joseph Azrack and Abigail Congdon; Millicent and Eugene Bell Foundation; Charina Endowment Fund; Laura DeBonis and Scott Nathan; Bill and Lucile Hicks; Chris and Lisa Kaneb; William and Helen Pounds; Ruggles Family Foundation; Corey Sauer; Thomas Stair and Lucy Caldwell-Stair; and four anonymous donors (names available upon request). Support for the endowment fund for FRONTLINE is provided by Robert Radloff and Ann Beha. Support for FRONTLINE/Columbia Journalism School Fellowships is provided by the Abrams Foundation and The Tow Foundation. Support for FRONTLINE digital video is provided by the Lisa and Douglas Goldman Fund. The FRONTLINE Dispatch is made possible by the Abrams Foundation. Support for FRONTLINE is provided by viewers like you, Corporation for Public Broadcasting, John D. and Catherine T. MacArthur Foundation, Park Foundation, The John and Helen Glessner Family Trust, Ford Foundation, Wyncote Foundation, and the FRONTLINE Journalism Fund with major support from Jon and Jo Ann Hagler on behalf of the Jon L. Hagler Foundation. Additional support for the FRONTLINE Journalism Fund is provided by: Joseph Azrack and Abigail Congdon; Millicent and Eugene Bell Foundation; Charina Endowment Fund; Laura DeBonis; Chris and Lisa Kaneb; Ruggles Family Foundation; Koo and Patricia Yuen on behalf of the Yuen Foundation; and four anonymous donors (names available upon request). Support for the endowment fund for FRONTLINE is provided by Jon and Jo Ann Hagler. Support for FRONTLINE/Columbia Journalism School Fellowships provided by the Abrams Foundation and The Tow Foundation. Support for FRONTLINE virtual reality provided by a grant of $580,000 from the John S. and James L. Knight Foundation, with the balance of the project costs covered by FRONTLINE series funds. Support for FRONTLINE digital video is provided by Chris and Lisa Kaneb. Support for FRONTLINE is provided by viewers like you, Corporation for Public Broadcasting, John D. and Catherine T. MacArthur Foundation, Park Foundation, The John and Helen Glessner Family Trust, Ford Foundation, Wyncote Foundation, and the FRONTLINE Journalism Fund with major support from Jon and Jo Ann Hagler on behalf of the Jon L. Hagler Foundation. Additional support for the FRONTLINE Journalism Fund is provided by: Joseph Azrack and Abigail Congdon, Millicent and Eugene Bell Foundation, Laura DeBonis, Chris and Lisa Kaneb, and 3 anonymous donors (names available upon request). Support for the endowment fund for FRONTLINE is provided by Jon and Jo Ann Hagler. 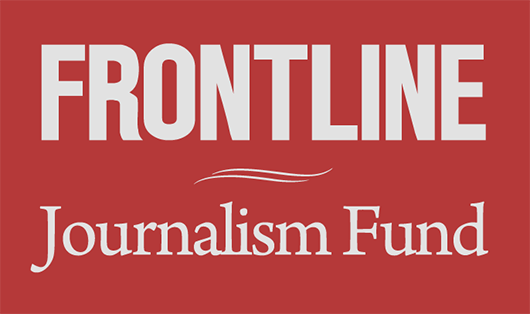 Support for FRONTLINE is provided by viewers like you, CPB, John D. and Catherine T. MacArthur Foundation, Park Foundation, Ford Foundation, Wyncote Foundation and the FRONTLINE Journalism Fund, with major support from Jon & Jo Ann Hagler. Support for FRONTLINE’s YouTube series provided by the John S. and James L. Knight Foundation. Support for the endowment fund for FRONTLINE is provided by Jon and Jo Ann Hagler. Support for FRONTLINE is provided by viewers like you, CPB, John D. and Catherine T. MacArthur Foundation, Park Foundation, Wyncote Foundation, and the FRONTLINE Journalism Fund. Support for FRONTLINE is provided by viewers like you, CPB, John D. and Catherine T. MacArthur Foundation, Park Foundation and the FRONTLINE Journalism Fund. Support for FRONTLINE is provided by viewers like you, CPB, John D. and Catherine T. MacArthur Foundation, Reva and David Logan, Park Foundation and the FRONTLINE Journalism Fund. Support for Tehran Bureau is provided by the Flora Family Foundation, The William H. Donner Foundation, Inc., and the James M. and Cathleen D. Stone Foundation. Support for FRONTLINE/WORLD is provided by the Nathan Cummings Foundation. Support for FRONTLINE is provided by viewers like you, John D. and Catherine T. MacArthur Foundation and Park Foundation. Support for FRONTLINE podcasts is provided by RealNetworks Foundation. Support for Tehran Bureau is provided by the Flora Family Foundation and The William H. Donner Foundation, Inc.